The Institute utilizes a broad range of highly advanced scientific approaches to understand the causes of these disorders. 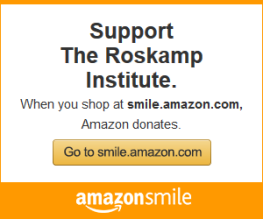 From this work novel treatments developed by The Roskamp Institute are in clinical trials in Europe and the U.S.
One of the goals of The Roskamp Institute has been to discover new and effective treatments for Alzheimer’s disease. Previous work by the Institute’s lead researchers (Dr. Michael Mullan and Dr. Fiona Crawford) has shown that certain genetic variations may cause or predispose humans to Alzheimer’s disease. These genetic variations have given scientists clues about the Alzheimer’s disease process. In particular these studies led to the identification of a small protein called ß(beta)-amyloid as central to the disease process. Beta-amyloid accumulates in all cases of Alzheimer’s disease and, as it does so, neurons are damaged leading to their malfunction, which is reflected as memory loss and other cognitive change. This process, once begun, is irreversible, but much evidence suggests that if ß-amyloid could be prevented from accumulating, the disease could be halted. Much of the research conducted by the Institute involves experimentation on ways to prevent ß-amyloid from accumulating and damaging the brain. Posttraumatic stress disorder (PTSD) is caused by exposure to a severe life threatening traumatic event. PTSD has a significant impact on the mental health of patients. To date, there are very few pharmacotherapeutic options for treating PTSD, and patients are typically refractory to current FDA approved treatment strategies.. Over the last few years, our team (led by Dr. Fiona Crawford) at the Roskamp Institute teamed up with Dr David Diamond, an expert in PTSD research and behavioral neuroscience at the University of South Florida, and began the development and validation of a novel preclinical model of PTSD. In studies that complement the extensive Alzheimer’s research of the Roskamp Institute, other aspects of neuronal dysfunction, degeneration and repair are being examined through work on Traumatic Brain Injury (TBI). With over 1 million traumatic brain injuries in the US each year, TBI is a common and major health problem. An estimated 5.3 million Americans are living today with a TBI-related disability. Through collaborations with the Tampa Veterans Administration and the Defense and Veterans Head Injury Program, Institute researchers previously demonstrated a role for the Apolipoprotein E (APOE) gene in mediating recovery after TBI. Cognitive recovery was poorer in TBI sufferers carrying one or two copies of the e4 form of the APOE gene (the same form that contributes risk for Alzheimer’s disease) versus those that carried no copies of that form. In order to better understand the role of APOE and other factors in recovery after head injury, Institute researchers are examining global gene expression in injured brain tissue compared to non-injured, where different forms of the APOE gene are present. Through analysis of these genetic responses and cognitive and behavioral changes resulting from TBI, cellular pathways of neuronal damage and repair may be identified. The ultimate goal of this work is to identify new ways of treating TBI by interrupting these pathways. Roskamp Institute researchers are investigating the contribution of various vascular factors that occur in the brain that can both trigger and promote the pathology of Alzheimer’s disease. In particular, they are focusing on the biological activity of the Alzheimer’s disease ß-amyloid peptides in cerebral blood vessels. They have shown that the β-amyloid peptides can constrict human cerebrovessels and that the cerebral blood flow in transgenic mice (that spontaneously development Alzheimer’s Disease) is reduced, possibly leading to neuronal damage and memory loss by impairing normal nutrient delivery and waste removal in the brain. The Roskamp Institute researchers have now dissected the molecular events at the origin of the vasoactive effects of ß-amyloid peptides and are testing the ability of various drugs to counteract the effect of ß-amyloid in the vasculature in order to develop new therapies against Alzheimer’s disease. This work is also providing new knowledge regarding the mechanisms controlling the growth of blood vessels. A spin off of this work is that in experimental studies the beta-amyloid protein has been shown to successfully inhibit the growth of cancers by strangling their blood supplies. This is particularly important for the design of anti-cancerous drugs since the growth of tumors is dependent on the formation of new blood vessels that allow the delivery of nutrients and oxygen to the growing tumor cells. 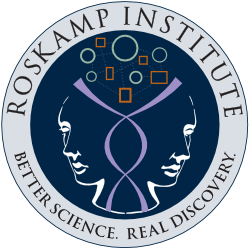 The Roskamp Institute was the recipient of a contract from the Counterdrug Technology Assessment Center of the Office of National Drug Control Policy for research on the genomics and proteomics of drug abuse. Advanced proteomic technologies have thus been developed at the Institute and have been used with genomic technologies to analyze the genomes and proteomes from diverse tissue sources. Comparative genomic and proteomic analysis of drug-exposed versus non-exposed cells and their sub-cellular fractions is underway. The primary goal of this work is to explore the etiology of the addictions, to identify biomarkers of drug abuse, and to identify new compounds with potentially therapeutic activity. The Roskamp Institute also has an active childhood disorders research program that has been exploring the genetic contribution to Tourettes Syndrome (TS) and Attention Deficit/Hyperactivity Disorder (ADHD). Patients with TS, ADHD, autism and other childhood disorders, and their families, participate in these studies by contributing blood samples and family history information. Characterization of genes and proteins which may play a role in TS is underway and one gene in particular has been identified at the site of chromosomal disruption occurring in some TS patients. Institute Researchers are currently working to understand how this gene may cause Tourette’s Syndrome.